Who took their best shot, literally, in 2016-17? Check out how these six (there’s a tie for fifth spot) players hit the mark last season. 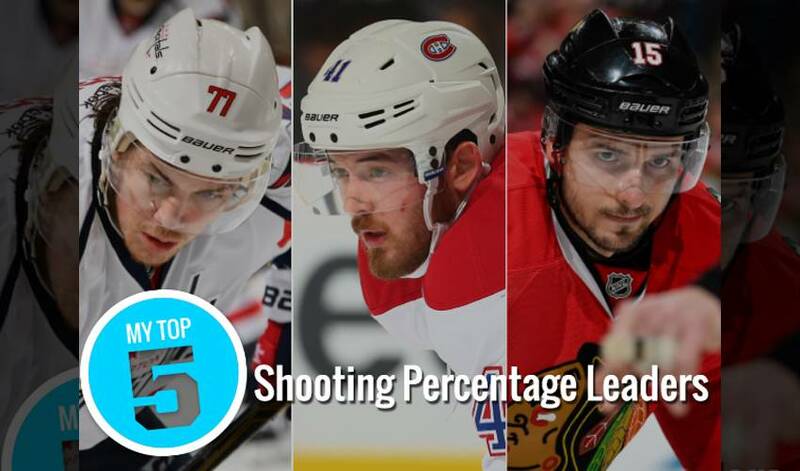 Take a look at some serious sniping talent, including a Capitals star that tops the list in this week’s Top 5. Washington’s first-rate forward scored an NHL career-best 33 goals (on 143 shots) in 2016-17. Seven of his goals came via the power play, one was short-handed, and four were game-winning tallies. He took less than 100 shots, 96, to be exact, but Byron made the most of them, netting a career-high 22 goals for Montreal. Six of his lamp-lighters were game winners, while one came when the Habs were short-handed. The 29-year-old centreman tied his NHL career-best (22) in goals on just 105 shots. Anisimov, who also had a personal-best 45 points, recorded seven game-winning tallies and had four power play goals for the Blackhawks. Winnipeg’s emerging superstar soared to several career-high marks in 2016-17, including goals (32, on 160 shots), assists (50) and points (82). Five of Scheifele’s tallies were of the game-winning variety, while seven came when the Jets were on the man-advantage. Johansson, who played in all 82 regular season games, also had a career year in multiple offensive categories, most notably, 24 goals (on 129 shots) and 58 points. Five of his goals netted the Capitals a win and five came via the power play. The Swedish star bulged the twine for Anaheim a career-best 33 times (on 177 shots) in 2016-17. Rakell’s biggest impact came in the game-winning goals category, as he led the league with 10 tallies, one more than the Western Conference trio of Jeff Carter, Cam Atkinson and Filip Forsberg.